My favourite street cat catching warm sunshine on a hot tin roof. I’m not even sure if this photo qualifies for this week’s challenge; the roof tiles are near and the sweet orange kitty is far. This is my response to the Weekly Photo Challenge: Near and Far. You have done very well with this one. Depending on one’s perspective… the cat can be either “near” or “far”… which makes this a very solid image for the theme. very cute… and the colour and texture together… nice! I like how the kitty is a little surprise. At a glance I almost missed the cat. 🙂 Whether or not it fits, nice photo. He does blend in nicely with the roof. Maybe I should have waited to use this photo, but I was too excited to share it with everyone. The picture is great, the cat darling! Hot tile, hot tin it matters not! It is a pleasant sight to behold! Sure you don’t want to work for a photo magazine?????? Have a beautiful day! In time the cat will warm up to you and not just the hot roof! We had a Feral cat that took almost a year to warm up to us and my old Cocapoo, then she was ours for many a year! May God Bless! Keep the articles coming they are so enjoyable and interesting! Thank you kindly Rosemarie. I really hope the kitty warms up to me. He was born in the empty house beside ours and I would go every day to watch, only watch as the mom was very protective. I hope he comes around. 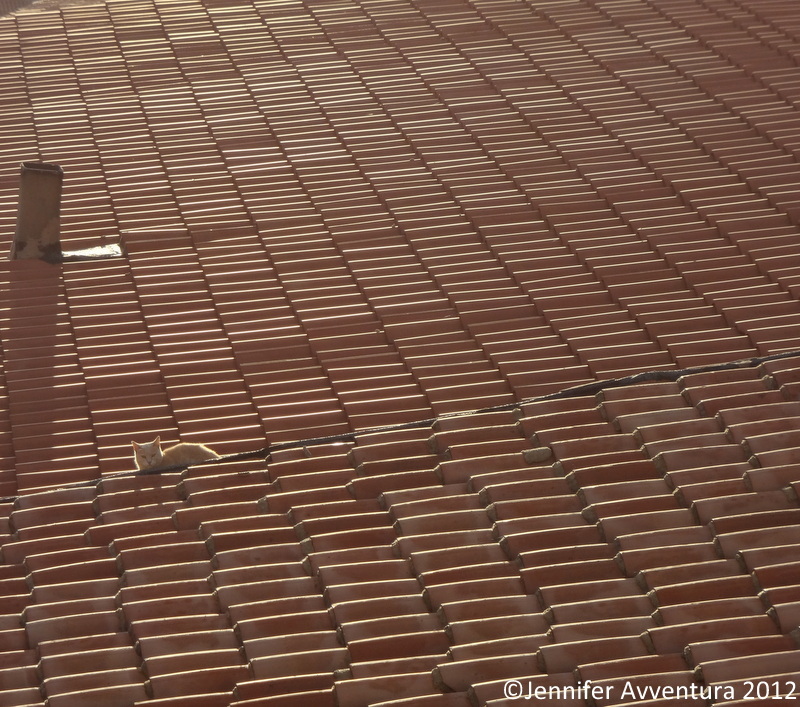 I like the way the kitty’s color blends well with the roof tiles. Thanks, he is a cutie! Love the CAT between NEAR sight and FAR sight. Oh, thank you kindly. I actually second guessed myself with this photo. Im glad you liked it.